The Conundrum Of Clothing – ACRONYM Inc.
One of the many hurdles I’ve had in my life has been that of fashion. I’m terrible when it comes to putting together an outfit to wear in public, and for years my default solution to this was to include a bow tie and a funny pair of pants, topped with some sort of sweater when appropriate, and thus hoping for the best. 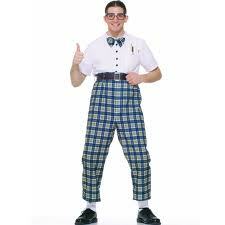 I’ve often had to explain that I did not grow up wearing bow ties and funny pants, but adopted this look when I got older. As a kid, my parents gave me jeans, t-shirts and regular bowl haircuts. But the point is that I had not real sense of style; coordinating colors, matching shirts with pants, or understanding what was and wasn’t seasonally appropriate was somewhat beyond me. Occasionally I would add a hat into the mix (non-ball cap, of course), and this would draw further confusion as to my overall appearance. I remember one girlfriend in particular who would groan when I would show up with a hat, and she would ask me to take it off once we arrived anywhere we went. During my tenure at The Bookstore, my dress code required button-up shirts, slacks & ties, an outfit that I was ill-suited to provide for my employer at first. I remember my mom mailing me a box of ties she picked up as a sympathy gift, and I struggled for ages trying to figure out how to keep them around my neck properly, something I never learned growing up. Our family has always managed to give new meaning to the idea of casual fashion, and ties were never a part of the experience. Why? Tell me what I’m doing wrong! Of course, little would come of this request. Fashion, so I suspected, was an, “You either got it or you don’t,” quality, which I lacked entirely. My temporary solution became black and gray pants coupled with white shirts. Just about any tie could go with that. Years passed, and I began to pick up the smallest tidbits here and there about what I should (and, more often, shouldn’t) be wearing. I would resort to the “all one color” solution when it came to matching, or by wearing all wild clothing that would elicit random compliments that did not connect to the little I knew. As my clothes became more and more monochromatic, I withdrew further and further from a desire to know (or care) about what fashion was really all about. From what I could gather, you either had to be gay, a regular GQ reader, or employ a team of consultants to “look good,” and whats more, the cost of “nice” clothing was extremely repellant to me. You want me to spend how much on that pair of jeans? $80 for shoes you have to replace in a month? Not playing the game made more sense to me, and by consciously making the decision to drop out of fashion, I was ironically playing the least attractive fashion card there is. As with many things in my life, dating and women drove my continued fashion frustrations. Clearly, there was a correlation between the clothes I wore, and the women I met, and more to the point, I was regularly being told by girls I would date that they found my appearance to be less that desirable (ironically, only after I met them). The solution finally occurred to me one night, while drinking with a number of girls that I had become friends with. They had launched into a lengthy discussion of clothes, and I began to tune out as I usually did in these circumstances. However, when one of them mentioned that they had found something for one of their boyfriends, solving the conundrum of clothing finally struck me: have one of these girls take me shopping! It seemed the perfect compromise to having fashion-conscious friends that I had no idea how to talk to. About once a year I would arrange one of these shopping trips with one of the girls I knew, and they were more than happy to accommodate. What girl doesn’t like having a doll they can dress up any way they’d like? While I was never very good at figuring out how to arrange the clothes on my own once I got home, at least having the clothes in my possession increased my chances of looking good. When I met my current girlfriend, I was at first a little unnerved by the fact that she would regularly buy clothes for me when I wasn’t around. The items she bought were quite nice, and while I did have a few things that looked good before I met her, I often felt that my old wardrobe didn’t match up very well with the excellent selections she purchased. However, I was also nervous about maintaining my own identity. A lot of the clothes she got for me weren’t exactly part of any style that I had ever maintained, and while they were clearly very nice clothes, it was a look that I had never worn before. I slowly began to incorporate a shirt here, or a pair of pants there, hoping that I wasn’t veering too far off into the realm of Not Me. Around the time that we moved in with each other it finally dawned on me that I was worrying for no good reason. Not only was I making a commitment to her that I felt good about, but it was clear that she was not trying to change who I was, but rather attempting to clothe that person in cool looking threads. The things she was buying were not particularly far off from some of the styles I’d fooled around with in the past, and now I finally had a woman to take me shopping – and to go shopping for me – in a way that really made me look as good as possible without having to struggle too badly with these abstract fashion concepts I seemed perpetually in the dark about. Little by little I weeded out all the lame non-dress pants, the falling-apart shirts, and the stupid socks for things that actually looked awesome, and I even beefed up my shoe count to a respectable number instead of relying on one pair of black shoes to go with everything. There are still times when I have a little fashion freak-out, and feel absolutely baffled by how to make myself look decent. Today, as I was dressing for my second day of work, and I had a near meltdown, going through three different shirts before I finally convinced myself that I’d landed on something that not only matched but was work-appropriate. But these moments are rare, now. One of the incredible comforts of finding a long term partner is that problems like this are no longer things you need to face alone. A huge worry that has troubled me for most of my life – my own fashion – has been resolved entirely in a way where I don’t have to think about it and I get to look good. That’s rare in this world, and I owe it all to my girlfriend. This hasn’t, however, solved the problem of my own fashion nonsense. I look at clothes, and they still confuse me. I have no idea why some things match while others do not, and understanding how to determine color coordination is still a big mystery. What’s funny to me is that, much like art, I can recognize good fashion when I see it, but I have no idea how I could ever go about assembling it on my own.